The Michigan State University Vietnam Advisory Group (commonly known as the Michigan State University Group and abbreviated MSUG) was a program of technical assistance provided to the government of South Vietnam as an effort in state-building by the U.S. Department of State.From 1955 to 1962, under contract to the International Cooperation Administration in Washington and the Vietnamese government in Saigon, faculty and staff from Michigan State University consulted for agencies of the Ngô Đình Diệm regime. The group advised and trained Vietnamese personnel in the disciplines of public administration, police administration, and economics. MSUG worked autonomously from most U.S. government agencies, had unmatched access to the presidency, and even assisted in writing the country's new constitution. Several of its proposals were undertaken by the Vietnamese government and had positive results for the people of Vietnam. 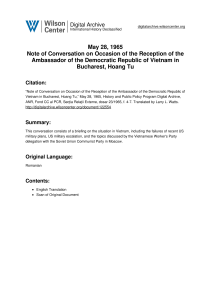 However, the group had limited influence on Diệm's decision-making and on the course of events in Vietnam, and publications by dissatisfied faculty led to Diệm's termination of the contract.When implications later arose that the Central Intelligence Agency had infiltrated MSUG as a front for covert operations, the technical assistance program became a cause célèbre in the early years of the anti-war movement.